Technical Ceramics, Cemented Carbides and Anti-wear Coatings can prevent each of these types of wear - but the selection of the right material for the job is the difficult bit. Aegis Advanced Materials Ltd can advise you on the right material and then supply components which will combat the wear in the most economical way possible. To combat Abrasive Wear the wear-part must be not only be harder than the abrader, but also strong at a microstructural level, since the ploughing action of a highly loaded abrader could crush and shear surface particles off a weak material, however hard it was. So the hardness value of the material must also be matched by a high bond strength between grains of material (in the case of ceramics), between the hard carbide particles and their bonding metal (in the case of cemented carbides) and between the coating and the substrate in the case of coated products. The large family of cemented carbides (usually Tungsten Carbide with various amounts of binder metals such as cobalt or nickel) have proved to be the best general purpose materials at fighting abrasive wear since they were invented 80 or so years ago. These are amazingly strong materials and by making them with extremely fine grain sizes the maximum abrasive wear resistance can be obtained. Traditionally, most wear parts made from cemented carbides have been produced by compacting a dry powder, machining it to shape by turning, milling, drilling etc and sintering it. Now there is a newer technology which can make complex tungsten carbide wear parts in one forming step only, using a special injection moulding technique. 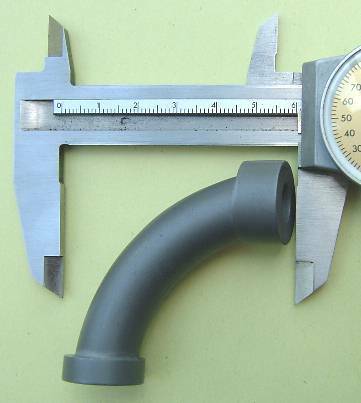 Parts like this pipe bend can be made by this process that could not be made in tungsten carbide at all before. Also, in the case of parts with complex detail, the moulding process often shows cost benefits over convenionally machined components. AAM Ltd can supply a wide range of tungsten carbide grades and also certain ceramic materials formed into parts weighing over a Kilo by this process. To fight Adhesive Wear the wear part must have a low chemical affinity for the abrader, both at ambient and also at high temperatures, since the asperities of the two parts may be much hotter than ambient due to shearing friction. Ceramics tend to have a very low affinity for bonding to metals, so materials or coatings with ceramic-like natures tend to be the best at reducing adhesive wear. We are now all familiar with Titanium Nitride coatings for turning tips and drills - these coatings work so well not just because they are hard, but because the metal nitrides and carbides are fundamentally ceramic-type materials with low tendencies to stick to the true metals being machined. For machining abrasive materials like stone or filled plastics, coated parts don't work nearly as well, since the wear regime is not an adhesive one. Combatting Erosive Wear needs different properties again, since here it is sheer hardness that will give the best results, so long as the mini-impacts from the eroding particles cannot break the grain-to-grain bonds of the material or find a soft chink in the hard armour of ceramic grains. Boron Carbide ceramic blasting nozzles for fine grits last much longer than anything else does, and Boron Carbide is the hardest ceramic that is produced. In this application, however, there may be cost benefits from many types of ceramics and tungsten carbides, and Aegis Advanced Materials supplies nozzles made of Alumina Ceramic (micro-hardness around 2,000 HV), Tungsten Carbide (micro-hardness about 2,200 HV) and Silicon Carbide (micro-hardness about 2,500 HV), all of which are in commercial demand as nozzle materials with particular price/performance profiles. Of course, not many applications fall neatly into one of the above categories, so it is the experience and judgement of the Materials Technologists at Aegis that is necessary to find the best family of materials and then the right grade within that family.